We had rain today. At least two dozen times I’ve heard someone say, “It’s so cold!” as they ran inside for another layer of clothing. Fall has arrived, and I’ve been saving this quilt for months so I could pull it out and share it now. 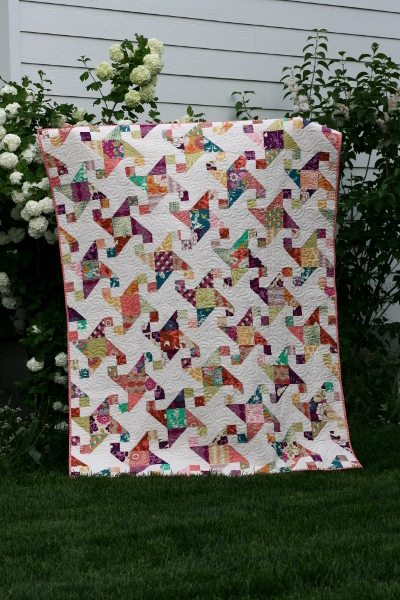 The fabric range is Bungalow by Joel Dewberry, a collection rich in color and lovely in print. Not necessarily an autumn collection, but to me autumn isn’t a time of just red, orange, brown, and yellow. I feel like everything deepens in color in fall, with a wider range of color than we assume. Somehow this collection feels like fall to me. My favorite part of the quilt, however, is probably the background fabric. 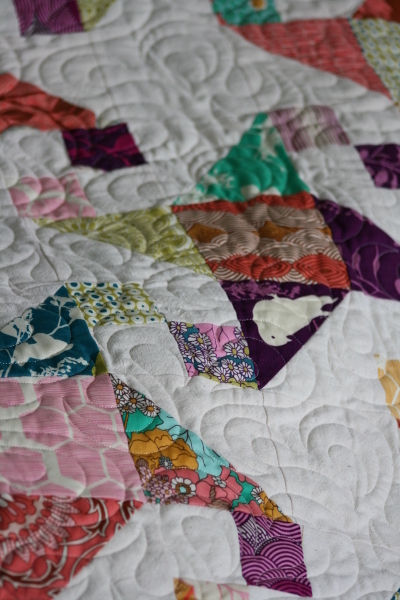 It’s a thick, yummy vintage linen sheet that I finally had the nerve to cut into, and it totally makes the quilt. I had it quilted by the talented Kaylene Parry (@quilterlove66 on Instagram). 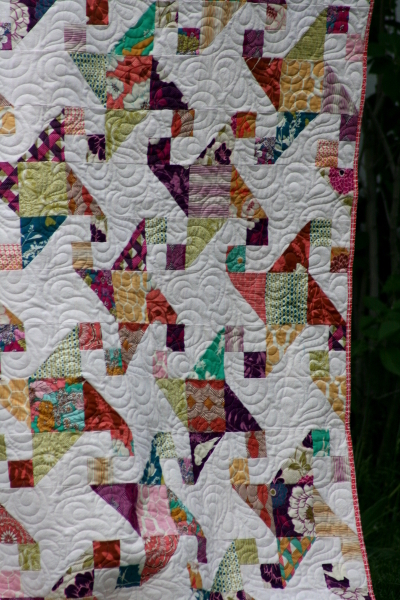 The quilting looks lovely on it and the texture is fantastic. I’m so happy with it! 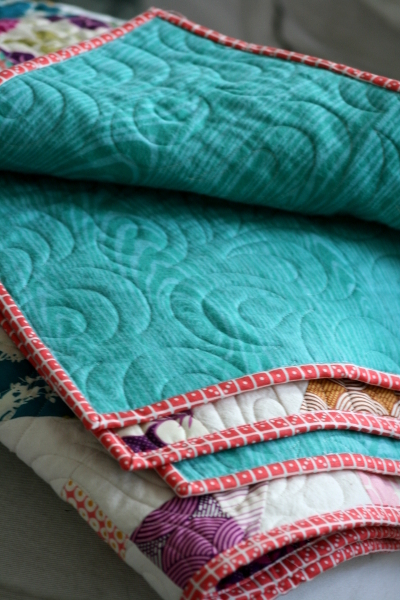 I finished the quilt with a rich teal woodgrain printed flannel backing, which makes this a fairly thick and cozy quilt. A coral print from the Bungalow collection finishes things off nicely. I’m so excited to have this one out and in use as we welcome the cooler weather. The pattern is Surfside, by Thimbleblossoms. It’s a layer cake friendly pattern and comes together quickly. Sometimes it’s nice to have quick projects to use up your stash! 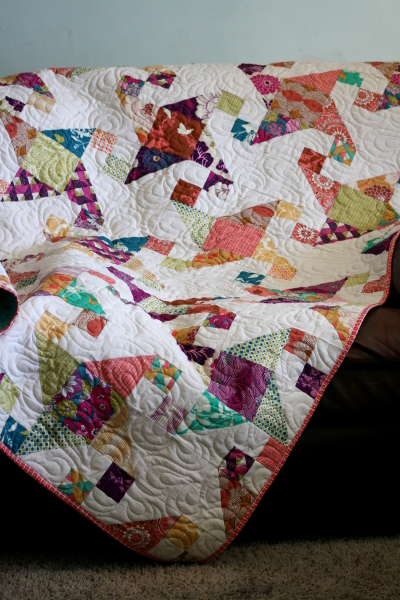 This quilt is begging to be used – time for a cup of hot chocolate, a warm fire, and a good book!